Toners Lab Series Oil Control Solution. 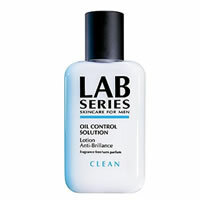 Lab Series Oil Control Solution is a refreshing lotion ideal for normal and oily skin. Lab Series Oil Control Solution leaves skin fresh, clear and shine-free, whilst also dissolving pore-clogging sebum and oil to help prevent blackheads. Lab Series Oil Control Solution contains an effective blend of salicylic acid and witch hazel which acts to squeak the skin, tone and tighten pores and help clear up acne-prone areas.